Airbus has reached another milestone for their popular A220 jet. It has now been approved to fly longer distances, being certified for 180 minute extended operations (ETOPS) from Transport Canada. This means carriers can consider new direct routes over water and remote regions, opening up endless possibilities for carriers. Airbus took the opportunity to demonstrate just what this range could mean for routes and connections. Although no providers have indicated they plan to use the A220 for transatlantic flying, Simple Flying reckon it’s definitely on the cards. 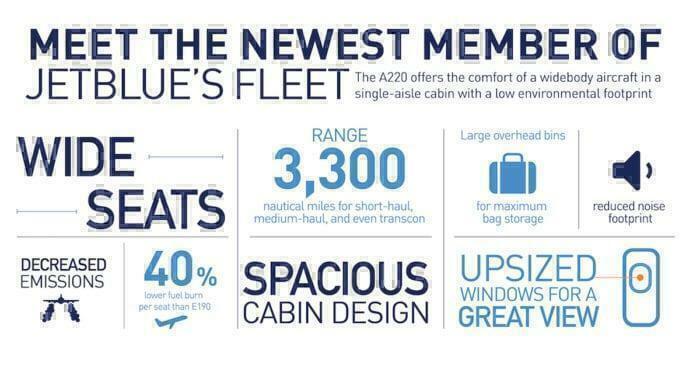 The A220 will be particularly appealing for thin and light routes, as it will be easier to near or reach capacity with fewer seats on board. It fits a beautiful niche in the market of being larger than a typical regional jet, yet smaller than traditional narrowbodies such as the 737 and A320. When Delta’s A220 goes into commercial service later this month, they’ll be the first of many airlines to operate the pocket rocket. The single aisle, 100 – 150 seat plane is fast becoming one of Airbus’s most popular models, with the plane maker securing orders for 527 of the jets so far. Just days ago, Delta signed up for another 15 A220s, bringing its total to 90 of the model. JetBlue have also gone ahead with an order of 60, and ‘Moxy’, the nameless airline founded by JetBlue’s David Needleman, has orders in for 60 also. Air Canada has 45 on order and are due to receive their first deliveries later this year. Outside of North America, the aircraft is also proving popular, with Gulf Air awaiting 10 A220-100s and AirBaltic having ordered 50 of the larger A220-300s. European launch customer Lufthansa have ordered 30 in total, which will be going to Swiss International, and Egypt Air will be replacing their entire E170 fleet with 12 of the A220s. Why does everyone love the A220? 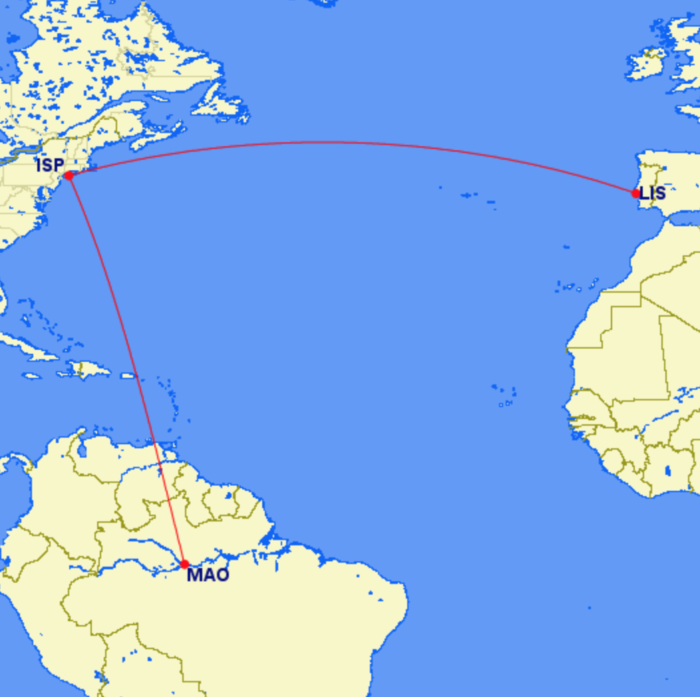 For most carriers, the A220 will replace smaller regional jets on homegrown routes. Delta plan to launch their A220-100s between New York LaGuardia and Boston, as well as between LaGuardia and Dallas / Fort Worth. As the year progresses, they’ll be deploying the aircraft from Dallas / Fort Worth to Salt Lake City, Minneapolis-St. Paul and Detroit, as well as LaGuardia connections to Houston and Detroit. JetBlue, on the other hand, have ordered the larger version, dubbed the A220-300, which seats around 130-160 passengers. Although they haven’t indicated any firm routes for the aircraft yet, with this ETOPS approval in place, they could use it to launch their anticipated transatlantic services. Certainly, one of the biggest draws of the A220 is its amazing fuel efficiency. When replacing the E190s, they will burn around 40% less fuel. They also have a greater range, making medium to longer haul an option for carriers. It also has a more generous cabin space, offering ‘widebody comfort in a single aisle configuration’. Seats can be wider, cabins more spacious, and an all business configuration is a realistic proposal. 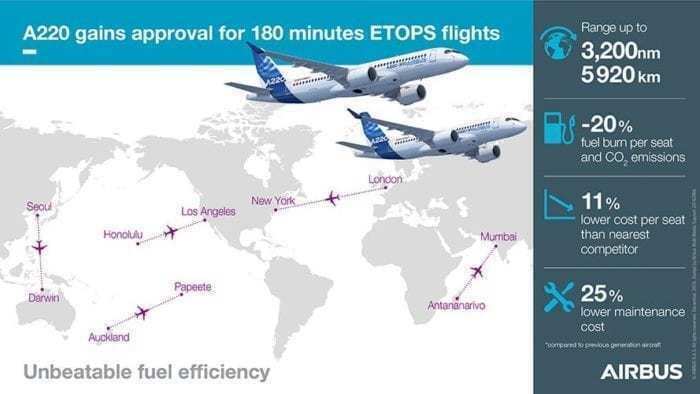 With the ETOPS in place, it can maximise its range of 3,200 nm to connect North America to Northern Europe, South America and other exciting destinations. Most interestingly, the A220 will be the largest specification of aircraft capable of landing at London City Airport. This means the potential to hop on in New York and hop off in the heart of London is a real (and very exciting) possibility. We can’t wait to see what a different the reimagined Bombardier aircraft will bring. Will you be flying? Let us know! yes it really is a bombardier aircraft it’s only by sleight of hand that it becomes an Airbus. Yes it certainly is… do you think it will be any better for having Airbus behind it?